GOOD LOOKING GIFT. BEST PRICE. This carbon humidor fits 25 cigars and featurs a Spanish cedar woos lining. It includes a hygrometer and humistat. I had an old humidor that I wanted to replace, but I wanted to get something different. This humidor is the "different" I was looking for! 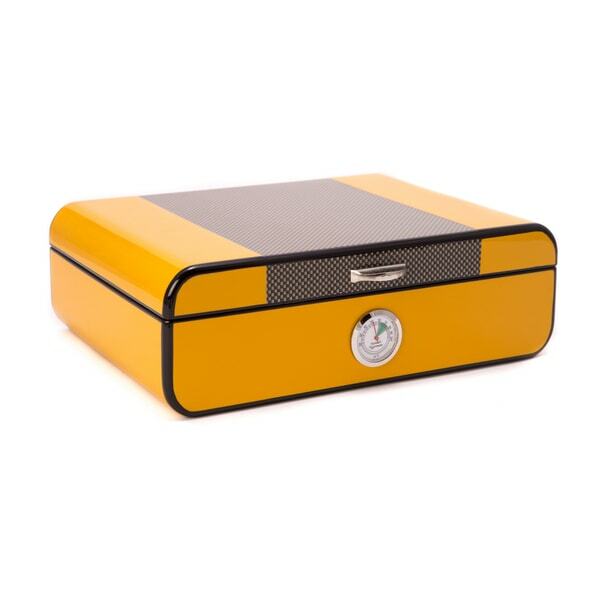 From the mustard yellow exterior color, to the hygrometer placed outside for quick viewing, this humidor is beautiful and stylish! This is a perfectly sized and stylish humidor for the cigar enthusiast. I got it as a gift for my boyfriend...but kept it for myself because it was sooo cute. My husband was thrilled with this. The look and the fact it’s already seasoned. We managed to get more than 25 sticks in it as well. Very cool looking humidor. Awesome humidor. Get tons of compliments. It holds humidity perfectly. Beautiful addition to my home. Very well made.